Jen Gobby is perusing a PhD in Natural Resource Science at McGill University through the Economics for the Anthropocene partnership. She holds a B.A. (Honours) in Environment with a minor in Anthropology from McGill. 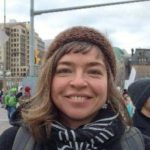 Her research interests include sustainability transformations of socio-ecological systems, environmental and climate justice, Indigenous right and resistance in Canada, and the potential of innovative marketing and mediation as tools of social change. She is conducting collaborative action research with Indigenous peoples engaged in actively blocking oil and gas pipeline development in Canada. When not wearing her academic hat, Jen resides on a small off-the-grid island. Paola Ruiz is a Business Consultant and presenter. She holds a BA in Finance from the National University of Colombia and completed Sustainability Management at Schulich while training to be a certified GHG verifier at the University of Toronto. 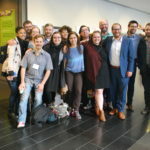 She is currently doing some pro-bono consulting in Toronto while working with start-ups in Latin America focused primarily on the Energy and social innovation sectors. Her practice has allowed her to travel extensively in Latin America to forge academic, government and non-profit links with many entrepreneurs and academics in the fields of Energy, Sustainability reporting and Carbon Trading. Geoff Yunker provides web development support to CANSEE. Geoff currently works as a senior strategic policy advisor with the Ontario Ministry of Natural Resources. Geoff provides strategic advice on such issues as climate change, provincial parks and conservation reserves, species at risk and municipal land use planning. Prior to this, Geoff worked in various positions providing executive support to senior government officials and as a biologist on Lake Erie. Geoff holds an honours degree in marine and freshwater biology from the University of Guelph. Meagan Curtis is an environmental policy and forestry consultant with a B.A. in Interdisciplinary Studies, an M.Phil in History, and M.A. in Forest Conservation. She works on a wide variety of topics including community-based natural resource management, national environmental policy, and small-scale forestry. She is interested in seeing insights from the humanities inform our economic imagination. Karolina graduated from Nicolaus Copernicus University in Poland majoring in Law, specializing in Environmental Law. She completed her degree working between Canada and Poland. This led her to employment at the Toronto office of the Polish Ministry of Foreign Affairs. She is currently pursuing a Master in Environmental Studies program at York University as well as Business Sustainability Diploma with Schulich School of Business. Her commitment, working closely with Professor Dayna Scott, allows her to research incentive-based policies in Canada and internationally as companies shift from ‘Liability’ to CSR. Karolina also part-owns a gelato shop downtown Toronto and co-manages a student-run consultancy with focus on sustainable business. James studied Economics at Concordia University. He also volunteered at the last two CANSEE conferences. In 2015, he also delivered a presentation on Canadian contributions to the Ecological Economics Journal. His interest in ecological economics stems from his earlier disillusionment of the failure of (neo)classical economics to incorporate how humans interact with their environment. Influenced by Economics Professors Elaine Perkins and Peter Victor, James notes that there are many facets to the economics field other than the conventional frameworks carved in stone from the time of Adam Smith or even Keynes. Along with the role of the environment, James wants to explore the colonial pattern embedded in Canadian economics pedagogy and the oppressive conditions which force people into marginalized situations – often caught in the struggle between economics and environmental stewardship.